How Do I Calculate the Inflation Rate? 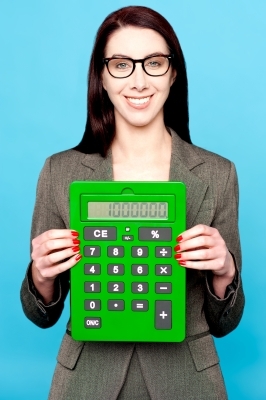 You are here: Home » Blog » Definitions » How Do I Calculate the Inflation Rate? The following article explains how to calculate the current inflation rate, if you know the Consumer Price Index. If you don’t know it, you can find it here. If you don’t care about the mechanics and just want the answer, use our Inflation Calculator. By looking at the above example, common sense would tell us that the index increased (it went from 100 to 185). The question is how much has it increased? To calculate the change we would take the second number (185) and subtract the first number (100). The result would be 85. So we know that since 1984 prices increased (Inflated) by 85 points. What good does knowing that it moved 85 do? Not much. We still need a method of comparison. Since we know the increase in the Consumer Price Index we still need to compare it to something, so we compare it to the price it started at (100). We do that by dividing the increase by the first price or 85/100. the result is (.85). This number is still not very useful so we convert it into a percent. To do that we multiply by 100 and add a % symbol. So the result is an 85% increase in prices since 1984. That is interesting but (other than being the date of George Orwell’s famous novel) to most people today 1984 is not particularly significant. Normally, we want to know how much prices have increased since last year, or since we bought our house, or perhaps how much prices will increase by the time we retire or our kids go to college. Fortunately, The method of calculating Inflation is the same, no matter what time period we desire. We just substitute a different value for the first one. So if we want to know how much prices have increased over the last 12 months (the commonly published inflation rate number) we would subtract last year’s index from the current index and divide by last year’s number and multiply the result by 100 and add a % sign. which equals 3.93% inflation over the sample year (Not Actual Inflation Rates). For more information you may check the current Consumer Inflation Rate and Historical Inflation Rates in table format. Or if you believe a picture is worth a thousand words you may prefer the Annual Inflation Rate plotted in Chart format. What Happens If Prices Go Down? which equals negative 2.11% inflation over the sample year. Of course negative inflation is deflation. (Not Actual CPI numbers). Has this article been helpful? We appreciate your comments.